. . . . . . . . . . . . . . . CRAAA-AAASH! . . . . . . . . . . . . . . . . .
A Gigantic Great Deafening Explosion Ensues – It is followed by a Complete Blackout as the asteroid makes shuddering contact with the Earth – obliterating everything for centuries to come. Just a few remnants of resilient and tenacious plant and animal life remain and a virtually indestructible stealth of varied microorganisms, tucked away in obscure subterranean passages and deep sea canyons and crevices. That wasn’t the first major asteroid strike on the Earth, either!
. . . and it won’t be the last! Scientists reveal that there are vast numbers of asteroids on the move in the solar system. Many of them pass the orbit of Mars on their way inwards in their elliptical course around the Sun – and are known as Near Earth Objects. Aside from all the meteors that burn out in the upper atmosphere, often falling as little meteorites afterwards, scientists also predict that roughly once every 100,000 years, one of these large objects will collide with the Earth causing global disaster, so they are busy cataloguing their courses and trying to devise deflective schemes to nudge them towards the Sun or away into deep space.
. . . But it’s a long shot! Let’s hope the Earth stays free of cosmic impact long enough for humans to develop the technology to terraform other planets in our Solar System that are suitable for habitation . . .
. . . long enough for humans to develop viable methods of ultra-fast travel over the vast distances of interstellar space, in search of new worlds to live on in other star systems . . .
. . . before humans, like the dinosaurs, are also extinguished forever on their world of origin! The Chicxulub impactor 65 million years ago had a dramatic effect on today’s forests, scientists say. The catastrophe that ended the reign of dinosaurs may have also helped forests bloom with flowers that could better withstand the post-apocalyptic climate. 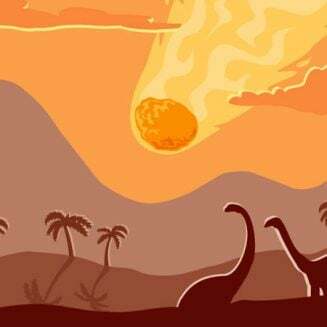 The prime suspect for killing the dinosaurs was a cosmic impact — the Earth was struck by a rock from space about 6 miles wide roughly 65 million years ago, near what today is the site of the small town of Chicxulub (CHEEK-sheh-loob), Mexico. This disaster would have released as much energy as 100 trillion tons of TNT, or more than a billion times the combined energy of the bombs that leveled Hiroshima and Nagasaki, leaving behind a giant crater more than 110 miles across. The giant tsunami, global wildfires, and dramatic cooling that happened after the asteroid or comet hit, killed the dinosaurs (save for the ancestors of today’s birds), paving the way for the rise of mammals. And, according to a new study in PLoS Biology [Public Library of Science Biology], a similar thing happened with plants. The Chicxulub mass extinction event devastated evergreen flowering plants, helping their seasonally flowering deciduous relatives take over. The scientists analyzed 1,150 fossilized leaves of angiosperms (the flowering plants, excluding conifers) embedded in rock layers known as the Hell Creek Formation, found in North Dakota. The investigators used those fossils to reconstruct the ecology of a diverse plant community that lived during a 2.2 million-year period spanning the cataclysm, which researchers believe wiped out more than half of all plant species. The team found that faster-growing deciduous plants replaced their slower-growing evergreen cousins to a large extent. Why? They suggest the cosmic impact led to a chaotically variable climate that favoured plants that grew quickly and could take advantage of shifting conditions. This could help to explain why modern forests are generally deciduous and not evergreen. The K–T of K-T Event is an acronym for the Cretaceous–Tertiary [Extinction], which occurred approximately 65 million years ago at the close of the Mesozoic Era and the opening of the Cenozoic Era, when the [already declining] Dinosaurs finally became extinct, leaving a space for the tiny, shrew-like Mammals to evolve and spread. The word Cretaceous means chalk-forming – and is derived from the Latin “creta” [chalk] usually abbreviated to K for its German translation “Kriede” [chalk], hence the technical term K-T [Cretaceous-Tertiary]. The Cretaceous geological period takes its name from the various calcareous marine nanoplankton found in the fossil record – following the Triassic and Jurassic, the Cretaceous is the last of 3 periods in the Mesozoic Era, spanning around 79 million years between 145 to 65 million years ago. Tertiary is the former term for the geological period from 66 million to 2.58 million years ago. Now known as the Paleogene and Neogene Periods it extends to the first stage of the Pleistocene Epoch – which is why the K-T Event is also referred to as the Cretaceous–Paleogene extinction event, or the K–Pg boundary. It is a time when many groups of animals, including non-avian dinosaurs, pterosaurs and large marine reptiles, died out – and when new groups of mammals and birds, as well as flowering plants [angiosperms], appeared. The first epoch of the Quaternary period, between the Pliocene and Holocene epochs. The present epoch, second epoch in the Quaternary period following the Pleistocene. Also called Recent.